WASHINGTON (CNS) — The incorrupt heart of St. John Vianney, the patron saint of parish priests, “reminds us God uses instruments to be ministers of his grace and mercy,” said Archbishop Christophe Pierre, apostolic nuncio to the U.S.
A six-month tour will take the holy relic of the saint — popularly known as the Cure d’Ars — across the United States. Sponsored by the Knights of Columbus, the “Heart of a Priest” tour was launched in wake of the clergy sexual abuse crisis in the Catholic Church. Supreme Knight Carl Anderson, CEO of the Knights of Columbus, said in statement that St. John Vianney offers an example to help the church heal and rebuild. “We now welcome as providential this opportunity to invoke the intercession of the patron saint of parish priests, whose holiness and integrity is a singular model for clergy,” Anderson said in his statement. St. John Vianney was born in 1786 and served as a simple parish priest in the French town of Ars. He was known to spend as many as 18 hours a day hearing confessions from people who traveled from throughout Europe to see the priest who was known for his holiness and piety. He also had a great love of and fostered devotion to St. Philomena. He died in 1859. Pope Pius XI canonized him in 1925 and proclaimed him patron saint of parish priests in 1929. His incorrupt body and heart are displayed at his shrine in Ars. 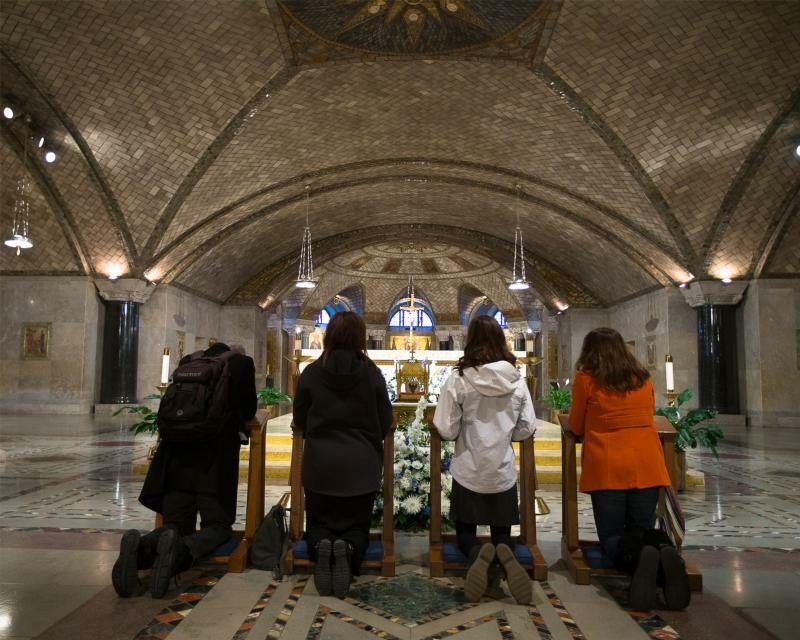 With a trumpet fanfare and solemn procession, the holy relic was brought into the Crypt Church at the national shrine in Washington and placed at the altar in front of an icon of the priest. It was to be on display through Dec. 12. 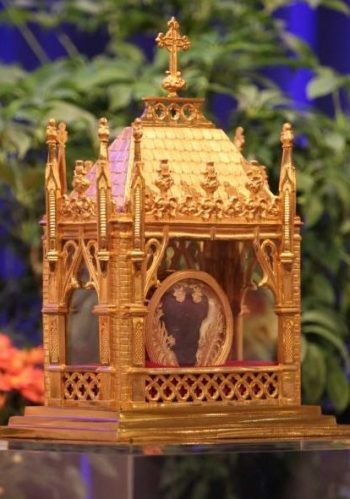 The Catholic Church teaches that a relic — such as the heart of St. John Vianney — is offered to the faithful for veneration, but neither the relic nor the saint is worshipped. Veneration recognizes the fact that God has worked through the saint. The nuncio also said that veneration of the saintly priest could lead to young men to consider a vocation to the priesthood. “Perhaps there will be three men here — or maybe more — whom the Lord will raise up to be his faithful priests,” he said. Among those at the national shrine considering such a vocation was Marek Nowak. He said his prayers to the patron saint of priests were twofold. “I am asking St. John Vianney to guide me as I consider a vocation, and I want to pray for a change of heart for those who think the church has let them down, and remind them of the goodness of God,” he said. “May St. John Vianney intercede for us and open our hearts so we can see what God’s love can do,” he added. Prior to its stop at the national shrine, the heart of St. John Vianney was displayed in Connecticut, Louisiana, Florida, Alabama and Georgia. After Washington the relic will be in Connecticut — in the Norwich Diocese Dec. 13 and the Archdiocese of Hartford Dec. 22-23. It will be in Baltimore Jan. 11. A news release from the Knights said that in between public events, the relic will travel to seminaries, religious houses and other locations for private veneration. “This is an opportunity to pray for a renewal in holiness,” he added.